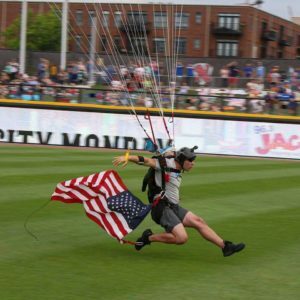 Fans of the minor league Nashville Sounds were treated to a unique game experience on Tuesday July 4th with an American flag jump into First Tennessee Park by Taylor Smith and Mike Looney, owners of Music City Skydiving. Supported by Helistar Aviation, MCS demo jumpers took to the sky on Friday June 30th for a practice run into the empty stadium. Jumping from around 5,000 feet, Taylor and Mike made the successful dry run from a Robinson R44 helicopter. 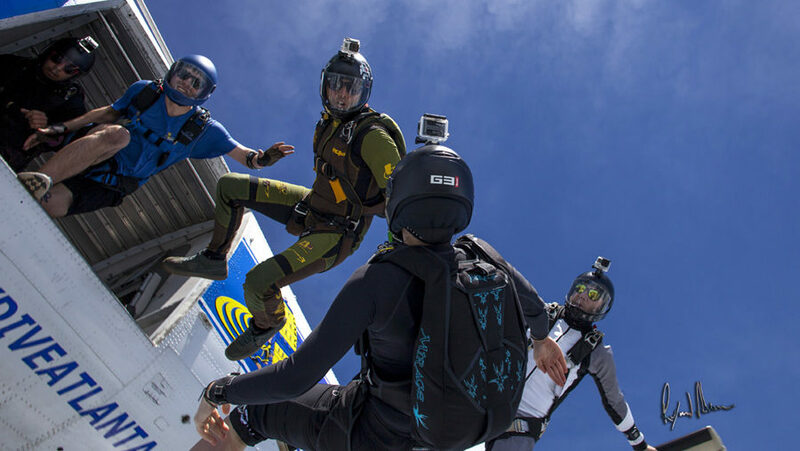 Demo skydives and a flag jump in particular are not just your average every day jump. Careful planning is required along with regulatory requirements such as FAA authorization. The flag must be stowed properly and handled with care so as not to interfere with a deploying parachute. Stadium jumps present challenges like shifting winds, often 180 degrees off of the upper winds and swirling inside. this means the demo jumper must land in the opposite direction from their approach which involves a 90 to 180 degree turn at point low to the ground. Monday came with some fog and winds but soon enough cleared out and conditions were excellent for the demo. MCS staff and regular jumpers were on hand to assist as ground crew. The jump went off exactly as planned and Taylor brought the flag in to several thousand cheering fans. Nashville’s news stations were their to document the event and MCS received some nice free press for the efforts. Afterward Mike and Taylor hung out, answered questions, promoted and then joined the group of fun jumpers up in the stands for the game. Unfortunately the jump didn;t bring the team enough luck as they lost 9 to 8. With one of the fastest jump planes in the country, Music City Skydiving outside of Nashville, Tennessee is the hottest jump ticket around! Opening weekend at Music City Skydiving! !